In addition to the pot discovered in Structure Fourteen, Hilary, a volunteer from Cheshire, has made a very exciting discovery – a ceramic piece that is anthropomorphic in nature!! 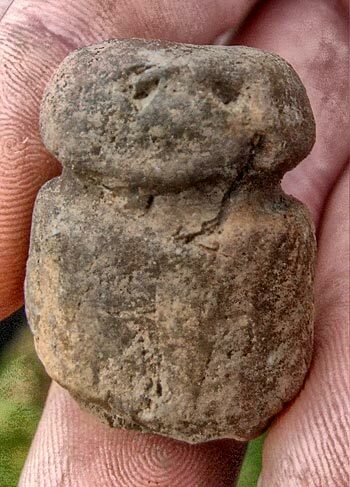 The small clay ‘figurine’ is about only 30mm high but would seem to display a head, body and two eyes. Although not as clear cut as the famous, and beautifully executed, “Westray Wife” discovered at the Links of Noltland two years ago, this find would seem to be a fairly crude representation of the human form. One end of the object is broken and it may originally have been part of a larger clay object that once broken, had “eyes” added to create a small figurine – the “Brodgar Boy”! Late in the phasing of the site, discovered in 2008 and then put to one side somewhat, the northern corner of the main trench has come into its own today. Hugo, and his team, have been gradually making sense of these initially ephemeral structures (Structures Thirteen and Fourteen). By this afternoon, they were beginning to see signs of floor deposits, but a surprise was lurking in a corner. Stacey, a UHI Masters student, was investigating a piece of flagstone, lying, at an angle, against a wall, when he noticed a piece of pot underneath it. Throughout yesterday afternoon the pot was gradually disinterred from its resting place. Sitting upright in the midden, which had enveloped it, the vessel looked, initially, as if it had a round bottom. 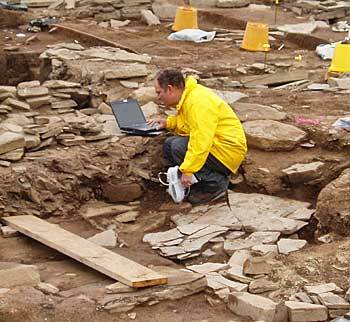 This would have been particularly exciting as few round-bottomed vessels are discovered in the Late Neolithic. It also became clear that the little pot was decorated. Stacey, Hugo and the team wrapped the vessel in acid-free tissue as more of it emerged from the ground. The tissue was strengthened carefully by a further wrapping of parcel tape and gradually the pot was lifted from the ground. At this point the bottom fell off…or so it appeared to those gathered around, who let out a concerted gasp. In fact, a lump of mud adhering to the base of the pot detached itself revealing, not a round bottom, but a perfectly formed flat base. It is a lovely little pot, with sides which swell gently from the base to make a gentle flowerpot form. Wrapped in damp, acid-free tissue paper (to prevent drying and disintegration) it awaits some tender loving care from the conservators. In Structure Ten, the cleaning behind the “dresser” continued and a most intriguing find was made. Gathered together, in a discrete area, were examples of red and yellow ochre; stones with a depression in their centre, like little grinding dishes, and a small, stone rubber. Could this be a pigment production area – the location, and the materials, which went into the amazing painted stones which are turning up around the site? Further investigation is needed, but it is more than likely that the essential ingredients of the paint for the stones was manufactured on site. Scott has been busy “zapping” the area with his XRF (X-ray fluorescence spectrometer) machine, so, hopefully, we will get an answer shortly. 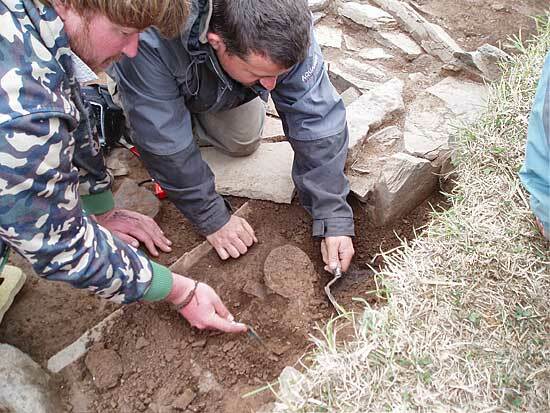 And, at the last minute, as the site was clearing up at the end of the day, Ray, in Structure Eight, discovered what looks like another stone ball, similar to that found by Kim earlier in the week. It looks slightly bigger then hers, but these amazingly tactile artefacts are becoming a firm favourite with the visitors, who are continuing to visit the site in ever-increasing numbers. 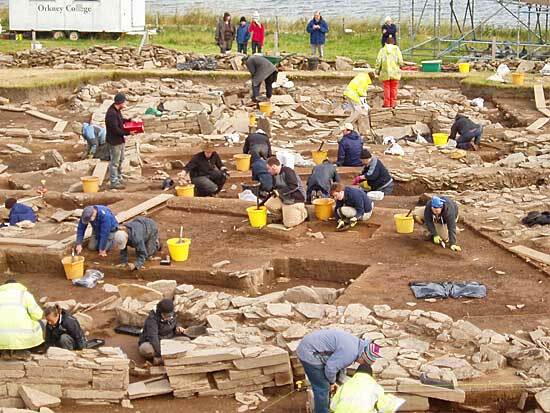 Hi from Gordon Mackie, a mature student from UHI, enjoying my retirement by indulging in the archaeology modules in the environment and heritage degree through Moray College. After many years visiting a very wide range of archaeological sites, in many parts of the world, this is my first actual experience on site with trowel in hand. What a site for this first step into uncharted territory for me! Superlatives do not do justice to what is an amazing site, set in such an atmospheric landscape, enhanced by the ever-changing Orkney weather. I have been lucky to have spent most of my time in Structure Twelve and been privileged to have found, what I understand to be, fine specimens of Neolithic pottery, and to have been able to experience an afternoon in the finds hut cleaning them up. What has also amazed me is the way the wide range of diggers, from all parts of the world and from a wide age range, get on with the job. The well-experienced have the patience to explain to novices, like myself, the intricacies of the site and what is a pot and what is not!